If you’ve been doing some form of boxing training such as bag work then the chances are you probably would have or are experiencing some form of wrist pain. This is actually quite common for people who train by punching the heavy bag or freestanding punch bag. A punch bag is used to build power as well as improve your technique, combinations and fitness, but unfortunately most beginners have the tendency to hit the punch bag as hard as they can without trying to improve any of the above other than power! If you’re focusing purely on power you may be able to escape without any wrist pain or injuries during your first few sessions on the punch bag but eventually the accumulation of stress and impact you’re putting on your hands and wrists will take its toll. Fortunately there are a few precautions you could take to prevent wrist pain and injuries. Rest and ice – If you’re in pain or injured the number one rule which is often neglected is to rest the injury. Resting can be quite a difficult task especially when you have the urge to just train but unfortunately it is a vital ingredient to a quicker recovery. Applying ice to the injured part of your wrist will reduce inflammation and pain and will also speed up the recovery process. If you carry on hitting the heavy bag whilst you have a wrist injury then you’ll just end up in a vicious circle. People recover at a different pace as this also depends on how severe the injury is. It might be worth visiting a physiotherapist to see how severe or minor the injury is, then ask how long you should rest for. Visiting a physio is not cheap so if you want to use your own judgement then rest the injury for at least 3 weeks then slowly start training again but at a much lower intensity, if you still feel pain then stop and rest for longer. Correct technique – Punching with the correct technique is really important, if you’re putting full power into your punches on the punch bag but you’re punching with poor technique then you’re just asking for trouble. Slow down your punches and reduce your punches until you’re punching with the correct technique then you can slowly add more power. Punching with the correct technique will reduce your chances of injuring yourself. Wrap your hands – If you’re not already doing this then you shouldn’t even be doing any bag work. Wrapping your hands when doing any sort of boxing training that’s going to put stress or impact on your wrists is compulsory. Unfortunately people do make the mistake of not wrapping their hands but there’s no excuse not to wrap your hands now as my tutorial will show you how to wrap your hands. Whether you knew how to wrap your hands or not, you will need a good pair of hand wraps if you wasn’t using them before. Wear proper gloves – Boxing gloves also offer protection for your hands and wrists, you need to make sure you wear the correct size and type of gloves when hitting the punch bag. Women’s boxing gloves are only slightly different to men’s boxing gloves as women tend to have smaller hands but a lot of women will still use men’s boxing gloves. When boxing gloves get worn out they will start to soften up and won’t offer your hands and wrists the same protection a brand new pair would, therefore it’s important to replace your boxing gloves once they have had its use. 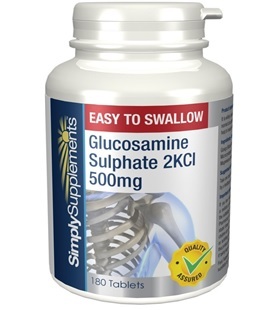 Take glucosamine tablets – I’m not a fan of taking many different types of supplements but taking glucosamine sulphate tablets really helped my wrists strengthened and allowed me to train on the punch bag 3 – 4 times a week without causing pain or aggravation. If you start taking these tablets you should start off with a low strength glucosamine tablet such as 500mg as you don’t want to be dependent on these, you still want your body to be able to naturally heal itself as well. You also don’t have to stick to the manufacturer’s recommendations on how many to take a day. The less the better but take the amount of tablets according to how your wrist feels but just don’t exceed the manufacturer’s recommendations.